Officials awaited daybreak to fully assess the scope of the destruction left in the wake of a deadly tornado in Granbury. Hood County Sheriff Roger Deeds said he hoped the death toll from the tornado would hold at six, with as many as 100 people injured and 250 people left homeless in Hood County. "It's definitely a nightmare," he said. The twister was part of a swarm of tornadoes unleashed on North Texas, devastating two neighborhoods in southern Granbury and a neighborhood in nearby Cleburne. 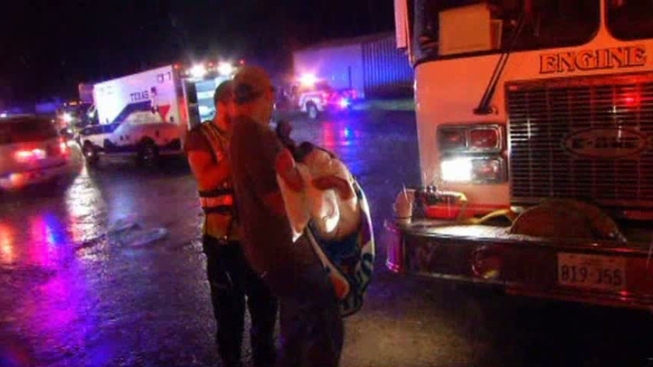 Six people were killed after tornadoes swept through Hood County and hit the town of Granbury. "I've been assured by my deputies on the scene that they're pretty confident with the six that they found, but there was a report that two of these people that they found were not even near their homes. So we're going to have to search the area out there," he said. Deeds said three tornadoes have been reported. The twisters damaged areas three miles east of Granbury that have about 110 homes, he said. "Most all of that is heavy damage," he said. Granbury residents say the tornado that moved through their neighborhood leveled homes. Deeds said the storm intensified at about 7:30 p.m., and reports of rotation came in at about 8 p.m.
"It was horrible. ... The house started shaking," one witness said. "We were in a closet. You could hear it -- it sounded like a train going off. It was scary." He said his house was fine but "everyone else's was horrible." Homes and other structures in Granbury were damaged or destroyed after an outbreak of tornadoes Wednesday night. Another witness described it as being "like hell." About 50 people were taken to a Granbury hospital, where 14 were admitted for treatment of injuries and two were transferred to a hospital in Fort Worth, about 35 miles to the northeast, Deeds said. People searching for family members are asked to call 817-579-2888. About 50 people gathered in the Oak Wood Elementary School after nightfall Wednesday to have their injured children examined by paramedics. Five were taken away by ambulance. 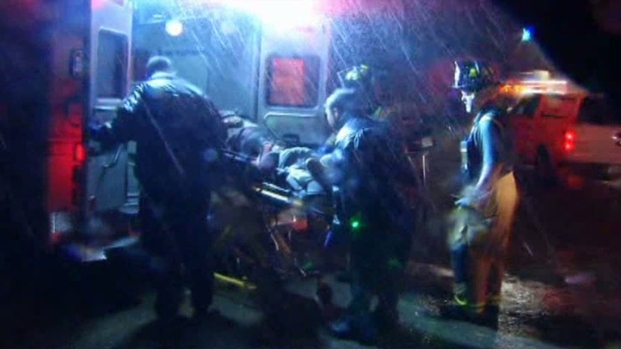 As many as 100 people were injured, said Matt Zavadsky, spokesman for MedStar Mobile Healthcare. His company sent three ambulances and a medical bus from its Fort Worth base to Granbury. Deeds said officials were trying to account for 14 people, but it was not clear if they were missing or were away from the area for other reasons. Hardest hit were two neighborhoods, Rancho Brazos Estates and DeCordova Ranch, in the southern end of the town of about 8,000 residents about 65 miles southwest of Dallas. Behind one house in the storm's path sits a detached garage stripped of much of its aluminum siding have with its garage door stove in and its roof torn off. Siding was scattered up to 50 yards away, and bits of fiberglass insulation draped on a fence. A tree behind the house was stripped of most of its branches, and a vacant doublewide mobile home on an adjoining lot was torn apart. Deeds spoke of a county road operations supervisor who lives in the affected area. "I've been told his home is destroyed but he was OK, so he was ready to go to work to help his neighbors. But he can't find his truck. The winds were strong enough out there that he still doesn't know where his truck is," Deeds said. Ambulances from as far away as Fort Worth were being called to Granbury, said Tye Bell, Richland Hills police spokesman who was heading to Granbury on Wednesday night. The same storm spawned another tornado that storm spotters told the National Weather Service was a mile wide. That twister tore through the southwestern quadrant of Cleburne, a courthouse city of about 30,000 about 25 miles southeast of Granbury. There were no reports of deaths in that storm, Cleburne Mayor Scott Cain said, "but we do have the potential for some injuries." He had no estimates. Cain had no estimate on the number of homes damaged, but he said he expected the number to soar into the dozens based on his inspection of damage ranging from roof damage to total destruction. 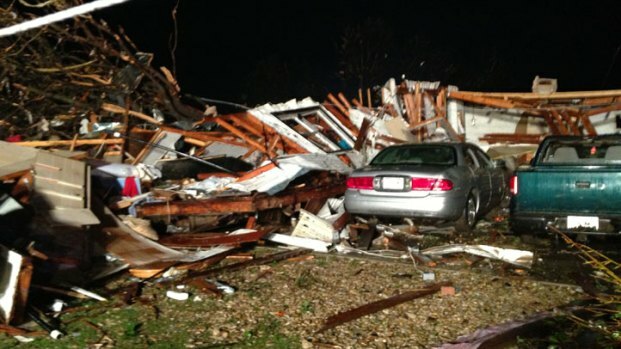 Another tornado hit the small town of Millsap, about 40 miles west of Fort Worth. Parker County Judge Mark Kelley said roof damage was reported to several houses and a barn was destroyed, but no injuries were reported. Hail as large as grapefruit also pelted the area around Mineral Wells on Wednesday evening. A police dispatcher reported only minor damage. NBC 5's Scott Gordon said people with minor injuries could be seen helping people with more serious injuries when he arrived on the scene Wednesday night. Gordon reported "widespread damage," saying he saw houses blown to pieces. He said he had not seen the worst-hit areas. Witnesses said homes in the area were leveled. "There's nothing left," one man said. A triage center was set up at Davis and Canyon roads, and school buses were called in to help transport people. Deeds said 250 people in total were taken away from the damaged areas. The American Red Cross has opened two shelters -- First Christian Church of Granbury at 2109 West U.S. Route 377 and Granbury First United Methodist Church at 301 Loop 567. People with questions about the tornado in Hood County can call 682-498-8010. Schools will be open on Thursday, Deeds said. The tornado was part of a system of severe thunderstorms that spawned several tornadoes across North Texas and dropped large hail in some areas. According to preliminary reports, there were 10 tornadoes in North Texas on Wednesday night.